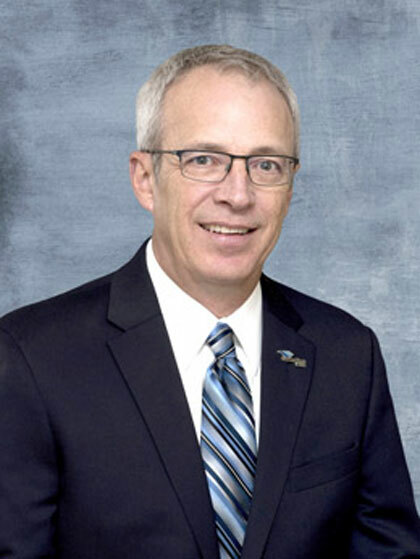 Alan Emshoff, president and CEO of Generations Bank in Exeter, was selected as chairman-elect of the Nebraska Bankers Association (NBA) during the association’s Annual Convention on Thursday, May 3, at the Embassy Suites in La Vista. He will assume the chairmanship of the NBA in May 2019. Emshoff began his career in banking in 1986 as a teller at Farmers State Bank in Avoca. He attended college while continuing to work at the bank, where he advanced to assistant vice president, loan officer, and licensed insurance agent. In 1992, he received a Bachelor of Arts in Business Administration from Doane University in Crete. After receiving his degree, Emshoff accepted a position as vice president of the First National Bank of Schuyler. He started working at the First National Bank in Exeter in 1997, where he was named president in 2000 and added CEO and chairman of the board to his title in 2010. Emshoff also leads two bank holding companies; he is president of Emswater Financial LLC and GLAASS Financial LLC. A lifelong learner, Emshoff is a graduate of the NBA Leadership Class of 1998; the Nebraska LEAD Program, Class V; and the Graduate School of Banking at the University of Wisconsin-Madison. Emshoff has taken an active role within the association over the years, serving on the NBA Board of Directors, Budget Committee, Government Relations Committee, Executive Management Committee and VEBA Board of Trustees. On a local level, Emshoff has been heavily involved in the Exeter community. He currently serves on the Fillmore County Hospital Board of Trustees, the Exeter Area Community Foundation Board of Directors, and the Fillmore County Development Corporation Business and Industry Committee. In addition, he is a past president and former member of the loan fund committee of the Fillmore County Development Corp. Emshoff has also served as treasurer of the Exeter Chamber of Commerce, and as a member of the Trinity Evangelical Lutheran Church Council and Doane University Alumni Council. Emshoff is married to Amy, a CPA at Generations Bank in Exeter. They have three daughters: Taylor, a CPA at Cornerstone Bank in York, is married to Kory Kahlandt; they have two children, Kolsen (3) and Kolbie (5). Madelyn is a registered nurse at Nebraska Hematology-Oncology Medical Clinic in Lincoln, and is married to Ben Underwood. Meredith is a social media director for KJHK Radio Station in Lawrence, Kan.